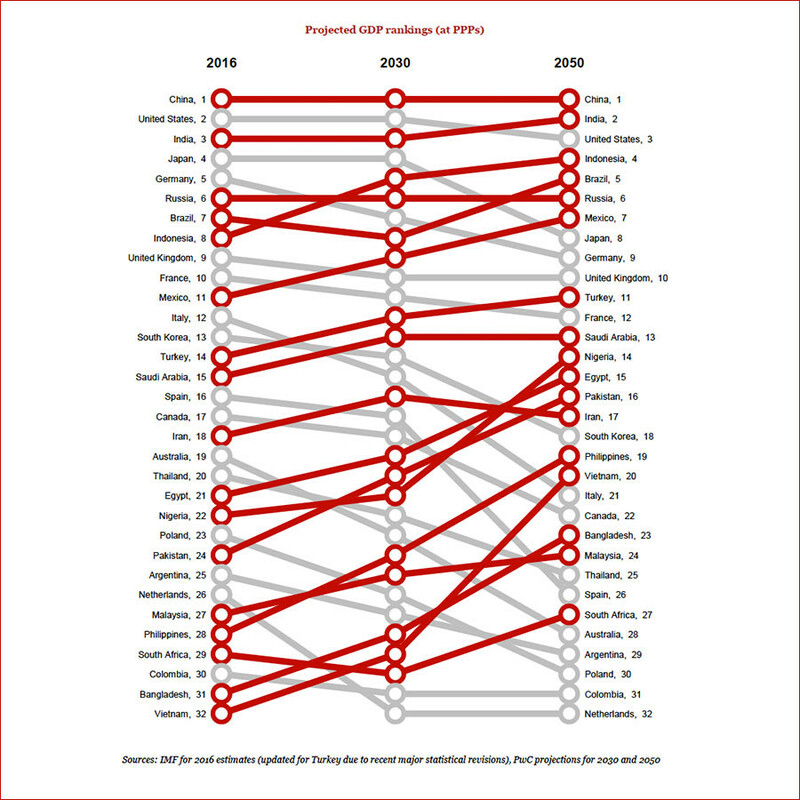 The report, called "The long view: how will the global economic order change by 2050?," ranked 32 countries, based on their projected Gross Domestic Product by Purchasing Power Parity (PPP). 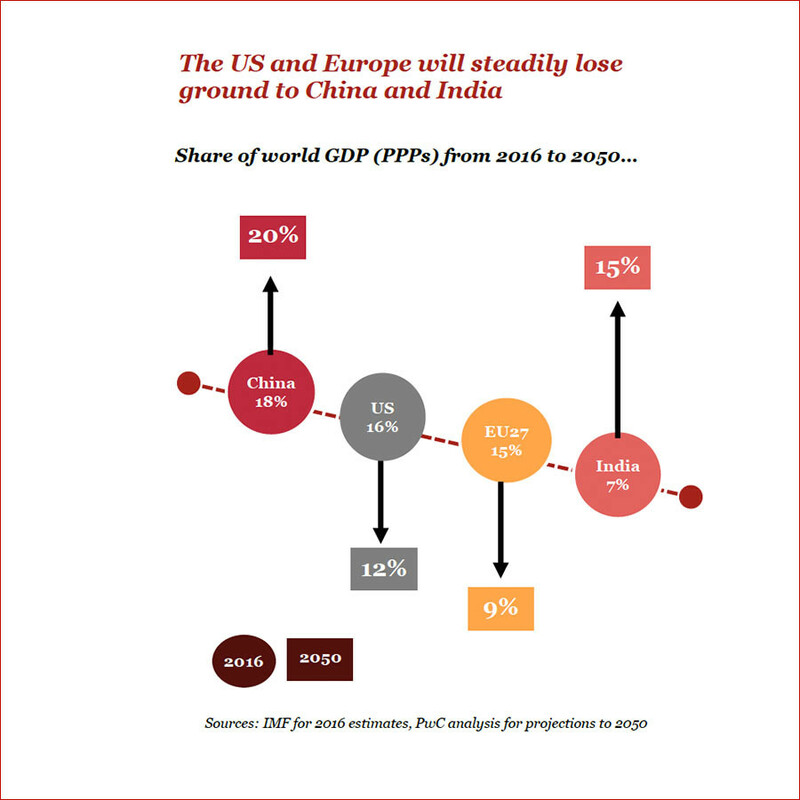 PwC concluded that by 2050, China’s GDP would reach $58.5 trillion, India, over $44 trillion, while the US will have a $34.1 trillion economy. “We expect this growth to be driven largely by emerging market and developing countries, with the E7 economies of Brazil, China, India, Indonesia, Mexico, Russia and Turkey growing at an annual average rate of almost 3.5 percent over the next 34 years, compared to just 1.6 percent for the advanced G7 nations of Canada, France, Germany, Italy, Japan, the UK and the US,” the report said. 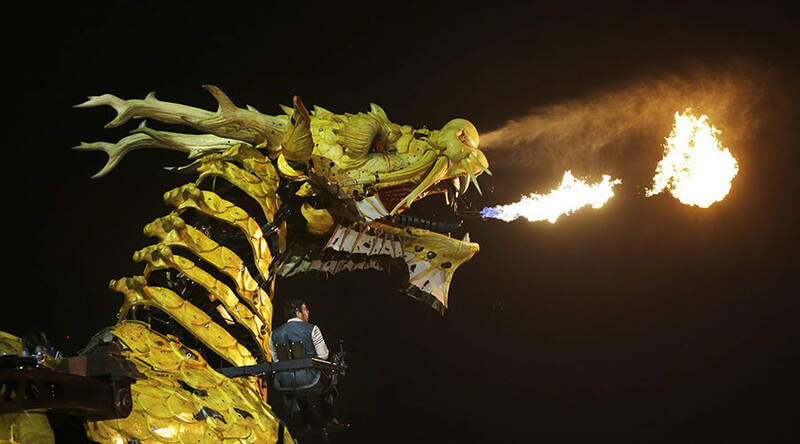 Given a robust annual growth of four to five percent, Vietnam, the Philippines and Nigeria are predicted to make the greatest move up the GDP rankings. The US and Europe’s share of global GDP are expected to shrink, while the Chinese and Indian economies are projected to grow significantly. 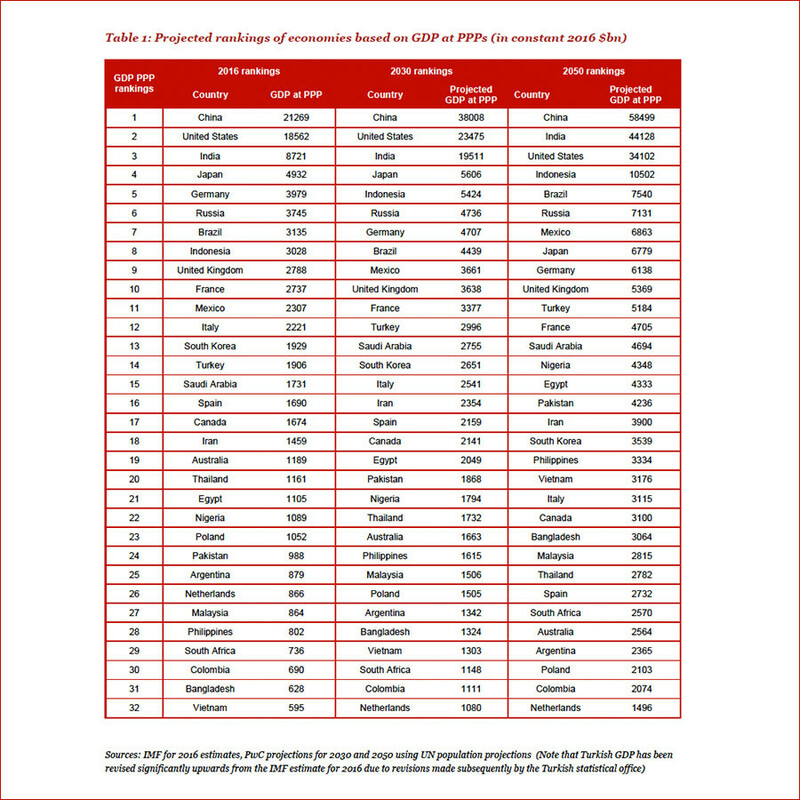 The consulting firm also predicted 2050 GDP numbers based on market exchange ratings, an alternative method for GDP calculation. 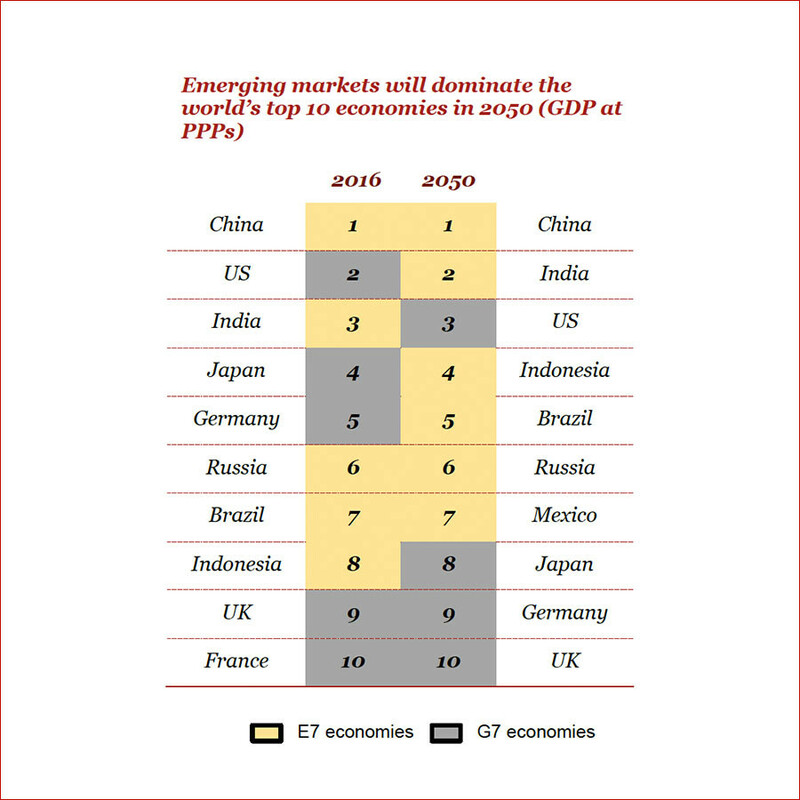 In these rankings, the US will lose global dominance by 2030, and the gap will only grow by 2050 with China having a nearly $50 trillion GDP, and the US having the same $34.1 trillion. Purchasing Power Parity (PPP) is an economic theory that compares different countries' currencies through a market "basket of goods" approach. PPP determines the economic productivity and standards of living of various countries over a period. Since market exchange rates fluctuate substantially, many economists consider PPP as a more precise way of estimating a country’s economy.